BRISBANE Isuzu has welcomed Isuzu UTE to its Eagle Farm location. From humble beginnings of a small car sales yard at Redcliffe more than 30 years ago, Brisbane Isuzu has stood the test of time in the motor industry. Today, it operates as Queensland's number one Isuzu truck dealer and has received many business achievement awards including the GE Business Achievers, Quest Business Achievers and Commerce Queensland Special Achievement awards. It is on the back of these successes that Brisbane Isuzu built the foundation for the grand opening last month of the Brisbane Isuzu UTE dealership at 208 Fison Ave, Eagle Farm. 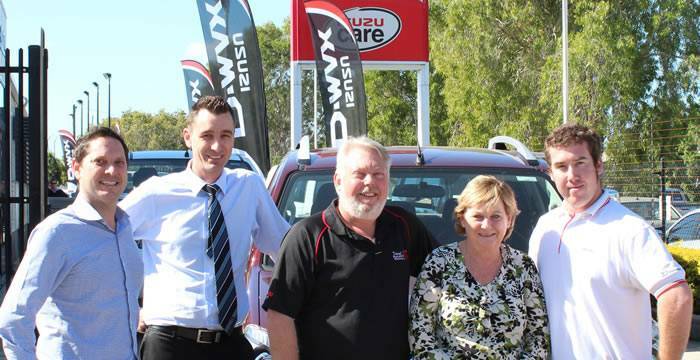 Brisbane Isuzu Dealer Principal Alan Newcombe was very excited with this new direction into the ute market. "Having been involved in this industry for as long as I have, I can see the potential the Isuzu ute has, and feel very strongly in the future development of this brand,'' he said. Mr Newcombe was also quick to point out that with the recent opening of its parts distribution warehouse, Brisbane Isuzu has the capacity to house a large number of Isuzu UTE parts. "This, combined with our night servicing, is our point of difference when it comes to being able to look after our customers,'' he said. Major development plans are also planned for the Eagle Farm site with a state-of-the-art sales showroom and a one-stop parts and service centre set for completion in mid-late 2014. The news of this new venture couldn't come at a more exciting time for both Brisbane Isuzu and Isuzu UTE with the launch of a new model. With a high-power, fuel-efficient 3.0-litre turbo diesel engine and super-strong ladder chassis, the Isuzu D-Max takes sharp inclines and heavy loads in its stride. It also has more safety features as standard than ever before, including dual front, side and curtain airbags, an anti-lock brake system and electronic brake force distribution. Also standard across the range is the added reassurance of electronic stability control and traction control systems, plus brake assist to help driver's stop more quickly and safely in an emergency. "The Isuzu D-Max UTE is one of the world's most popular and well-reputed one-tonne ute and cab chassis ranges,'' Mr Newcombe said.